In 2008, an experiment began in which scientists reduced water flowing into a lake to mimic drier conditions expected in the Canadian Boreal Shield due to climate change. Climate change across the Canadian Boreal Shield region may bring reductions in precipitation and runoff to its numerous lakes. In addition, many industrial developments divert water away from rivers and lakes. 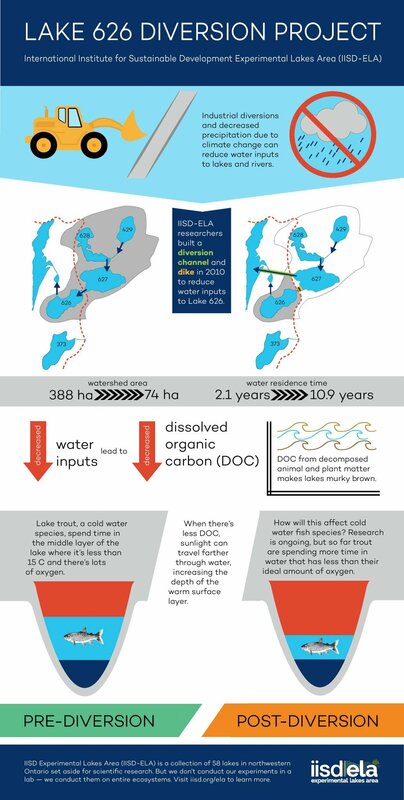 To examine the effects of changes in water flows on lake ecology, IISD-ELA researchers artificially diverted inflowing water to a typical Boreal Shield lake. Results from this experiment are expected to provide new insight into how Shield lakes, and its resident organisms, will respond to a drying climate and industrial diversions. One of the unique aspects of this work is our ability to observe the behaviour of lake trout in great detail, using implanted radio-transmitters and novel acoustic techniques. 2016 was the last year of intensive monitoring for this experiment, with reduced sampling in 2017. View a video on climate change research at the IISD-ELA here and read a feature piece on history and findings of the Lake 626 Diversion project here. Click here to download this infographic of the Lake 626 Diversion project. This experiment includes participation by Fisheries & Oceans Canada (DFO), Environment Canada and Climate Change (ECCC), University of Toronto, Milne Technologies, and Ontario Ministry of Natural Resources and Forestry (OMNRF).